At the holidays, it's tradition for many to make sugar cookies. Try this recipe for cookies that won't lose shape and are delicious. Last year, I found a recipe for the best sugar cookies, and we tried it out. 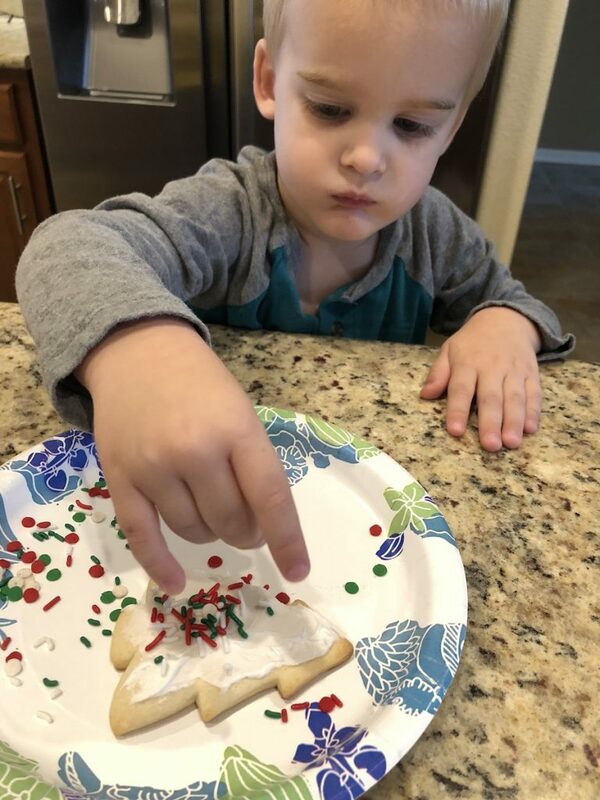 The recipe was perfect for making shaped cookies and decorating them for Christmas. They didn’t lose shape when cooked and taste delicious. Now, I am not taking credit for this recipe at all. I am merely just passing it on with my notes on what we did and what worked best for us. 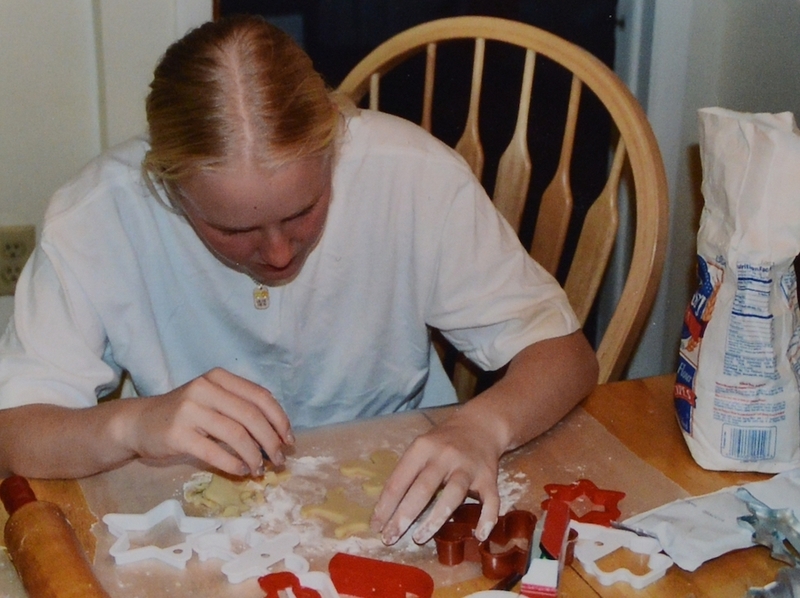 Growing up, we didn’t make the Christmas sugar cookies every year, but I do remember sometimes sitting around the table with my cousins and decorating cookies. We always had fun the years we did. It just wasn’t something that we made tradition, like our Christmas Sandwiches. And although it wasn’t something I always did, I wanted to start the tradition with my boys once they were old enough. Especially now, since Tyler loves helping in the kitchen so much, it’s a great family time. And Ryan is old enough to help decorate and not just eat it all right away, so we made a big batch of cookies this week for friends and neighbors, and of course, for ourselves as well. Start by setting the oven to 400F and preparing two baking sheets. I like to use my cooking stone as one, and used a regular baking sheet lined with parchment paper for the second. You want to have at least two pans in rotation so you can have one pan being prepared while the other is baking. Cream together your sugar and butter, stirring it on high for about 3 minutes. You want it to get nice and fluffy! Then add the eggs, mixing after each one, followed by the salt and baking powder. Mix again until everything is incorporated. Stir in 1/4 cup of buttermilk, vanilla, and almond extract. Then add in 2 1/2 cups of flour, stirring in 1/2 cup at a time. Add in the remaining 1/4 cup buttermilk and remaining 2 cups of flour. Test our your dough, and see if it’s too sticky. I didn’t think mine was at first, and when I started to roll it, the dough was a mess. I had to put it back in the mixer and add another cup of flour. You want it to pull apart pretty easily but not be crumbly. I would take a small scoop and try to roll it out and see how it feels. When you add more flour, if it needs it, do it in small amounts so you don’t put in too much. When you are ready to start making your cookie shapes, sprinkle the work surface with powdered sugar. As noted in the original recipe, these are sugar cookies, so it makes sense to roll them in powdered sugar. I like to use my sifter for this because it gives a nice light layer of powdered sugar and covers the counter. Roll your dough out to about 1/4″ thickness, and use your cookie cutters to make the shapes. I like to press all the cutters in on as much of the dough as possible, then pull out the scraps, leaving the shapes on the counter. Transfer the cookies to your prepared baking sheets and bake for about 10-12 minutes. The cookies should just start to get golden at the edges. If they are cooked too long, they lose the soft sugar cookie texture that you are aiming for. The tops should not get golden at all. I let the cookies sit on the pan for just a couple minutes when they come out of the oven, then carefully move them to a wire rack to cool. If you plan to frost and decorate the cookies (and really, who makes sugar cookies without the frosting and sprinkles), then you need to make sure they are completely cooled before trying to add anything to them. We baked these one day and then decorated the next. And, of course, eating them is always the best part! At the holidays, it’s tradition for many to make sugar cookies. Try this recipe for cookies that won’t lose shape and are delicious. Prepare 2 baking sheets and set aside. Then add the remaining 2 cups of flour. The batter should be smooth, elastic-like and slightly sticky. If too sticky, add more flour a little at a time (up to 1 cup – be careful to not put TOO much flour in the dough). Roll to 1/4 in thickness. Looks like the kids were having as much of a good time with this recipe as you were! They certainly were! They loved working on the cookies. That recipe looks easy and the cookies look perfect. I wish there was a non-gluten version of this cookie – alas, what there is just isn’t the same. Thanks for sharing! No gluten allergies here, so I am not sure what could be done to make it gluten-free for you. What a perfect recipe for the holidays- so much more personal than the store bought versions (and I’m sure much tastier)! Such a great family tradition that I’m sure will leave many joyous memories! To me, it’s also more fun to make cookies from scratch than from a store-bought dough. And the memories we make with it are priceless!! That is such a nice sugar cookie recipe! I like that mold. It so cool and perfect design for this season. This recipe is perfect because they hold their shape so they look great when sharing with family and friends. Thanks! They love when they get to help out in the kitchen! It’s fun to be able to teach them and have these memories of working together. They are perfect cookies! I hope you enjoy. Thanks for sharing this! With christmas around the corner my son and I could make these delicious sugar cookies. He is going to love this. It’s so much fun. It gets messy with kids, but they love it! I couldn’t agree more! It gets messy with them but it’s so much fun! 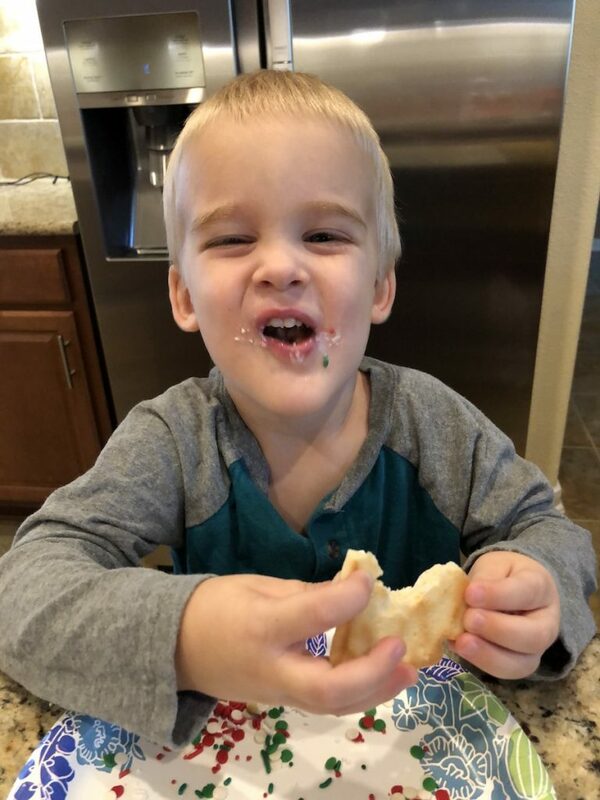 Love me a good sugar cookie! I’ll have to try these this year. Me too! They were so easy to make. Wow. Adorable. My sisters will love these cookies. Thanks for sharing the recipe. Thanks! They are so fun to make together. Christmas is one of my most favourite holidays and since I’ve been wondering which sweets to make for my family’s Christmas party, this article came across just the right time! The instructions look like something easy to follow! I really like your decorations too – still gonna figure out some more ways to decorate though lol! Thanks for sharing! These are great for a party because you can always leave them undecorated and let your guests have fun frosting and decorating the cookies. These Christmas sugar cookies looks so delicious. and perfect for Christmas treat for the kids. I bet that my kids will love this. I will try to make this next week. They are perfect for making with the kids because they actually keep their shape well so they are fun to decorate! These are such adorable photos! I love making Christmas cookies. It’s a tradition. It wasn’t tradition when I was growing up, but we are making it a tradition now for my boys! Love sugar cookies during the holidays. This looks like an unbelievable recipe! I wasn’t too sure the first time either, but it really is a perfect recipe! Ooh, we may have to try this this weekend! Making sugar cookies IS a tradition in our family, going back to when I was a child and we’d roll them out on my Mama’s mama’s cookie/pastry board. But I’ve never had a recipe that I’m truly happy with, even my mama’s recipe. My girls and I made a batch of sugar cookies last weekend (along with my favorite shortbread cookies), and I didn’t double the sugar cookie recipe as I should have – we ran out of time to ice them last weekend, and they’re already almost all gone! So we may have to make another round, and NOT make other cookies at the same time, so we have time to do the icing this time! Ooh, these look absolutely delicious… I love sugar cookies! I want to make some Christmas ones so will try out your recipe. These so good I’ll have to try it I will have to make them vegan for my My family but I am so interested in trying this out. This recipe seems easy. Tis the season where our kitchen smell deliciously good with those cookies baking. Your boys are having a great time helping out. Later on, I will bake some with my younger daughter. This is one of the simple pleasure of the Holiday Season that I enjoy the most. My husband loves soft and chewy sugar cookies so I may have to try this one! Looks so good! These look so delicious! My daughter and I used to make cookies every year. I think it’s time to resume that tradition and we’re going to start with these yummies! 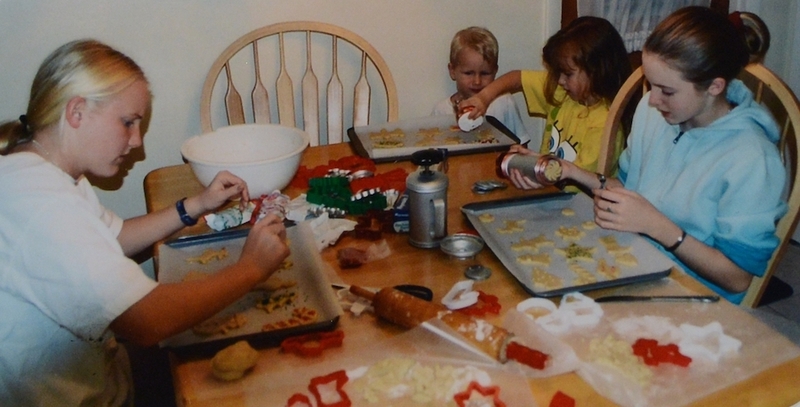 My kids and I used to bake cookies a lot when they were younger. I think it’s a lovely tradition plus, as they get older, kids remember fun things like that. Oh, your kids have their best time in your kitchen. These cookies are fantastic, love the colors and all these Christmas trees and other figures. This recipe sounds perfect! I love that you adapted it tou your own taste and that you began this lovely tradition with your boys! Homemade sugar cookies are definitely the best. This recipe sounds like it would taste amazing!